Drug discovery is a complex process in which multiple factors need to be optimized. One of the most important stages involves maximizing the cell permeability of compounds, since even the most potent molecule is worth nothing if it can't get into cells. A particularly intriguing challenge in this regard is to explain how nature has solved this problem by engineering natural products featuring "non Rule of 5" compounds- typically large, greasy molecules with several hydrogen bonding groups - acting as drugs. Nature seems to have overcome chemists' queasiness at making such compounds, and it's worth noting what lessons we can learn from her. Among other challenges, one has to get these drugs across lipid-rich cell membranes, and predicting this membrane permeability could be a very useful thing. One clever strategy that nature has adopted to do this is to fold up the molecule through lots of internal hydrogen bonds, thus minimizing its polar surface area and allowing it to be stable in the membrane. Naturally it would be quite useful to be able to theoretically predict beforehand which compounds will form such hydrogen bonds, and there have been a few papers taking a stab at this goal. Here's one such paper from a group at Pfizer which stuck out for me because of its simplicity. 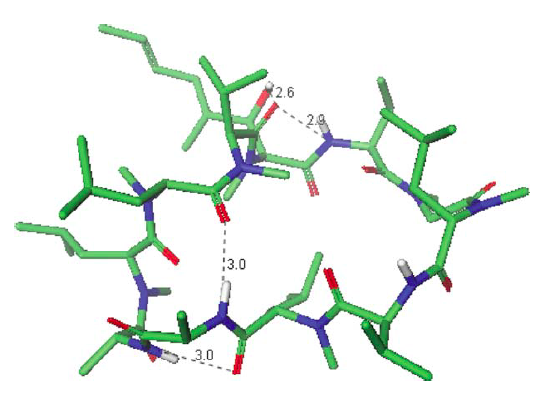 In it the author look at three apparently non-druglike compounds- cyclosporin (an immunosuppressant), atazanavir (an antiviral) and aliskiren (an anti hypertensive) and try to the theoretically account for their observed permeabilities. What they do is run conformational searches on these compounds in the gas phase (or in "vacuum", if that suits your anti-Aristotlean sentiments) and look at the low energy conformations. 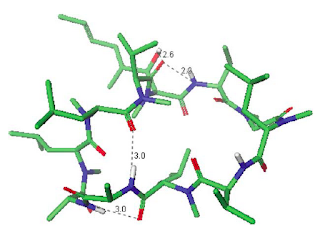 In two of the three cases the low-energy conformations present lots of intramolecular hydrogen bonds, and the authors say that this is consistent with the stabilization of the drug inside the membrane, account for its known high permeability and oral bioavailability. They also verify these hydrogen bonds through NMR in non-polar solvents which are supposed to simulate the lipid membrane. For the third compound, aliskiren, they observe only two groups hydrogen bonded in the gas phase and they think this is consistent with the compound's low permeability. The paper's conclusion is that the presence of hydrogen-bonded conformations in the gas phase is a fair predictor of favorable permeability. The study seems like an interesting starting point but I am skeptical. For starters, I have run more than my share of gas-phase conformational searches over the years and the one ubiquitous observation is that most polar, druglike compounds show "collapsed" conformations, with hydrogen bonding groups tightly interlocked. The main reason is that these calculations are carried out in vacuum, where there is no intervening solvent to shield the groups from each other. Coulomb's Law runs rampant in these situations, and a proliferation of collapsed, highly hydrogen-bonded conformations are a headache for any conformational search. So I am not surprised that the authors see all these hydrogen bonds. Sure, they say they don't see them for aliskiren, but even aliskiren demonstrates two so I am not sure how to interpret this conclusion. The other important thing is that what matters for membrane permeability is not just whether an internally hydrogen bonded conformation is present in a nonpolar medium, but whether the desolvation penalty to achieve that conformation from the initial panoply of conformations in water is easily overcome. It's hard to draw a conclusion about a favorable membrane conformation of a drug unless there is an estimate of the desolvation penalty. At the very least the authors should have carried out a conformational analysis in water to get a crude estimate. In contrast, another study trying to calculate the permeability of peptides seemed to take this factor into account. Lastly of course, the paper looks at only three cases. A much larger dataset will have to be examined in order to predict any correlations between hydrogen-bonded gas-phase conformations and membrane permeability. But while I am not sure the recent paper comes up with a general principle to do this, it's clear that conformational analyses of this kind (preferably in water, chloroform and the gas phase) will help. Understanding how nature has managed to engineer permeable, bioavailable beasts like cyclosporine is an important enough goal to benefit from such approaches. This brings up the old question that Paul Dobson asked: are we missing out some key transporters that could explain concentration of drugs in cells?